The current economic climate is pushing businesses to test the boundaries of anti-corruption legislation, with one in four managers surveyed sceptical that offenders will even be brought to justice. 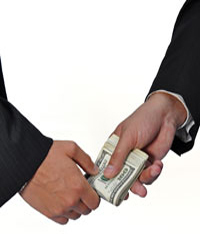 A study by FTI Consulting has found that 40% of executives, senior and middle managers across the business spectrum agreed that present conditions were encouraging companies to cut corners in complying with the UK Bribery Act. More than a quarter (27%) of the 571 executives felt it unlikely that the government would pursue and prosecute companies who do bend the rules, while 31% considered the legislation little more than window-dressing, believing that it represents little more than an ethical guideline and for appearances sake. The research also suggests that corrupt behaviour may be more of a top-down issue as 25% of those at board level interviewed, admitted they would risk breaching the Act, compared to only 16% of middle management. Concern does exist about the impact the Act will have on competitiveness, particularly in the BRIC (Brazil, Russia, India, China) countries. Although 80% of respondents think UK businesses should boost trade with growing economies such as BRICs rather than in the eurozone, almost half think it would be difficult to effectively conduct business in those countries and still adhere to the UK Bribery Act legislation. Russia, with 57%, was considered by executives to be most difficult to remain above board, followed by India (52%), China (51%) and then Brazil (48%).